The Violin Concerto No. 5, nicknamed the "Turkish" because the finale's exuberant outbursts struck 18th century Austrian ears as foreign (they didn't get around much), is filled with delectable twists and turns that reveal Mozart's uncanny ability to create magic out of even the simplest melody. A first-rate performance brings out all of this ingenuity, while letting the soloist's own light shine nicely. That was the case Thursday, as Augustin Hadelich, the exceptional German violinist, spun phrases filled with personality. His tone was sweet, without turning syrupy; his articulation was pristine, but never glib. And he provided fresh cadenzas that gave Mozart's themes all sorts of imaginative dimensions. 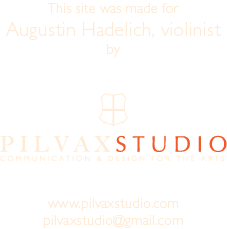 Note, too, that, in keeping with conventions of the composer's day, Hadelich frequently played along with the orchestra's first violins before breaking into his solos. Hadelich, who enjoyed smooth rapport with Suzuki and the orchestra, received an encore-inducing reception from the audience. His choice was Paganini's Caprice No. 9, which he delivered with an insouciant touch.